Coverage: Live on BBC Radio 5 live and sports extra, BBC local radio, plus live text commentary on every match on the BBC Sport website. Further coverage: BBC Radio Wales, BBC Radio Cymru, BBC Radio Scotland, BBC Radio Ulster and BBC Local Radio. 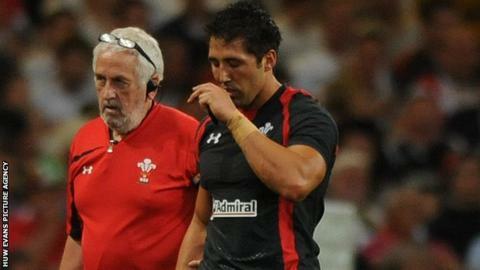 Gavin Henson is still hopeful of winning a Wales recall despite being out of the team since 2011. The double Grand Slam winner has not played in a World Cup, and believes Wales and Australia will progress from Pool A this year, not hosts England. Now at English Championship side Bristol, utility back Henson, 33, still dreams of adding to his 33 Wales caps. "I haven't ruled that out. I think I've got something those current players haven't got," said Henson. "I feel I could take our game to a different level. "I've got to prove that with performances when I'm playing in the Championship, which is sort of frowned upon by the Welsh management. "It's going to be tough, but I still hope - maybe the  Six Nations. "I was devastated to get that injury [broken fibula in May] and, looking at it now, Wales usually pick a big squad for the World Cup so there might have been a little outside chance I could have got in from the start." Wales host Uruguay in their opening World Cup match on Sunday, before facing England at Twickenham on Saturday, 26 September. With Australia also in the group, Pool A will provide the tournament with one of its first major casualties - and Henson thinks it will be the hosts. "I worry for England - I think they might be going out," he told BBC Wales Sport. "I like the brand of rugby they play. Will they be naïve enough to try and play like that against Wales at Twickenham? It'll be their downfall if they do. "Wales' defence will be on top in that game. I'm confident Wales will go through because they're going to beat England, Fiji and Uruguay. "I worry about England a little bit... they could be mentally scarred if they go out in that group stage. "They're such young guys, if they go out in the group stage, it could be tough for them to take." Henson has had a colourful - and, at times, controversial - career which has seen the Pencoed-born playmaker scale stratospheric heights and endure some miserable lows. As well as playing a starring role for Wales in their 2005 and 2008 Grand Slam triumphs, Henson was included in the 2005 British and Irish Lions squad which toured New Zealand. That series ended in a 3-0 defeat, and Henson has found himself embroiled in several off-field incidents. He apologised for drinking and "behaving inappropriately" on an early-morning flight after the Cardiff Blues' match against Glasgow Warriors in 2012 and, while at Toulon in 2011, he was suspended for a week following an off-field incident. Henson's main regret, however, is never playing in a World Cup. He missed out on selection in 2003 and 2007, while a wrist injury in Wales' final warm-up match against England ruled him out of the 2011 tournament. "It's a massive void in my career," he said. "I always wanted to go to a World Cup. I loved watching them as a kid and I was devastated to miss out on every one. "That's life - I've had a pretty good career anyway. "I don't think my career's over yet. "I'm 33 but I feel I've got a good few years left in me, but that's the story of my career - that I've missed out on the World Cups."